Teemu Leino can return to his hotel tonight a happy man after putting his Xray in the overnight TQ position. The Flying Finn produced the fastest run of the day in the first of the day’s three qualifying heats and the nitro European Championship debutant was naturally pleased with his day if not slightly cautious about tomorrow, ‘I’m very happy, it was a good day for me but there are still two more days to go so we will see’. Alessio Mazzeo drops to third retiring from the final heat suffering from grip roll but the European 1:10 B Champion is confident that he can challenge for the TQ position in tomorrow mornings final qualifier when the track should be at its best. Francesco Tironi failed to improve on his morning time and the Sirio team driver falls to 5th. Germany’s Michael Salven, who had a troubled first two heats, finally completed a run and it was good enough to put the Serpent driver into sixth place. Others to improve their times in the final run were Martin Christensen, Darren Johnson and Dario Balestri who sit 7th, 14th and 17th fastest repectively overnight. The general feeling among all the drivers in Madrid is that the times will tumble in the final qualifying heat tomorrow so it should be a very exciting if not tense atmosphere at the track in the morning. With the temperature rising for the second round of Euros qualifying in Madrid there was little change in the Top 10 as the track lost its grip with Adrien Bertin being the most significant mover. The Kyosho driver, who ran out of fuel during his first heat, recorded 18 laps in 5:12.706 to jump to 9th on the time sheets and bettered his fastest lap time from the mornings opening run. With all of this mornings top 10 failing to improve their times it is Finland’s Teemu Leino who remains in the provisional Top Qualifier position from Italian’s Mazzeo and Tironi. Other big names to improve in round 2 but still someway off the pace were Mugen’s Guiseppe D’angelo and the Team Magic pairing of Dario Balestri and Darren Johnson. D’angleo improved by just under 3 seconds to move up two places to 19th overall while fellow countryman and reigning champion Balestri made 18 laps jumping 21 places to go 23rd fastest. Johnson ran his first full five minutes but could only manage 17 laps and is well down the order in 35th. The fastest man in Madrid so far in terms of outright pace, Oscar Cabezas again had misfortune in Round 2 and failed to start after his car rolled in the warm-up causing damage to his Serpent. Similar bad luck struck team-mate Michael Salven whose engine dropped a plug at the start of the run. Drivers have one last chance today to improve their times and with temperatures starting to fall the track should be fast again when the leading drivers go out. We will bring you a full update later. 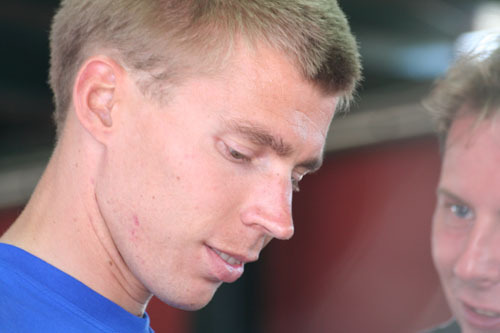 Finland’s Teemu Leino is the provisional pole sitter here in Madrid after the first round of qualifying for the 2007 European 1:10 200mm Championships. The Xray team driver who is making his Nitro Championships debut posted a time of 18 laps in 5:07.684 making the most of the cooler track conditions at the ARCA track with the weather being noticeable colder today. Alessio Mazzeo was second fastest proving his European B Championship win was well deserved. The young Italian Serpent driver ending up just under 2 seconds shy of Leino. It was another Italian Francesco Tironi driving a Kyosho who was third making it three different makes of car in the top 3. Martin Hudy, Niki Duina and Helge Johannessen complete the Top 6. Adrien Bertin with a time of 16.842 but the Team Orion driver Adrien Bertin was fast setting the second fastest lap time but ran out of full at 4:50. Serpent’s lead drivers Michael Salven and Mark Green also ran out of fuel while on target for a top position. Oscar Cabezas, the fastest man in yesterday’s timed practice, had engine trouble at the beginning of his run and currently lies 96th of the 146 runners but once the young star got going he set a new track lap record of 16.712 . Drivers have two more qualifying rounds today. 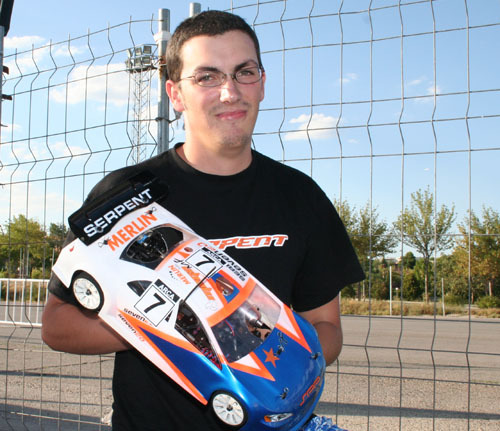 Serpent’s rising star Oscar Cabezas topped official timed practice today as the real action got underway at the European 1:10 200mm Championship in Madrid. The 20-year-old Spanish racer posted a time of 18 laps in 5:10.563 bettering the fastest time from Practice 1, set by Finland’s Teemu Leino, by almost 5 seconds. After a problem in the first session Adrien Bertin showed its business as usual for him with the Team Orion driver recording the second fastest run. ‘The car is good and we ran a good set-up so that we did not have too much grip’. 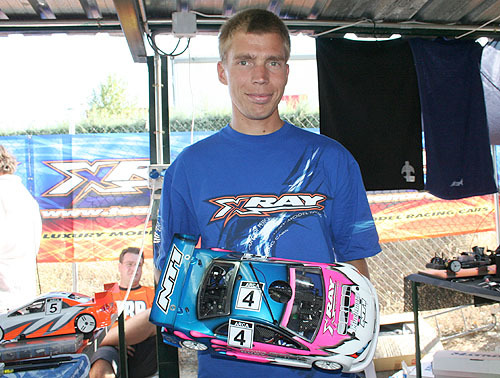 Leading Sirio driver Francesco Tironi was fourth fastest with his Kyosho while Xray’s Martin Hudy was fifth. Young Alessio Mazzeo completed the Top 6 with all three drivers making 18 laps on their second 5-minute run. While only 17th on the time sheets, Germany’s Michael Salven was fastest man on the track today posting a 17.000 lap time during his second outing. Unfortunately the factory Serpent driver ran out of fuel at 4:53 otherwise the 2007 1:8 EC Top Qualifier would most certainly have produced a Top 3 time. Contact with Darren Johnson destroyed Rick Vrielijnck’s second run but despite this the Dutch driver was feeling good about his car, ‘Johnson hit my car which caused the engine to go rich and this ruined my run but the car feels good and I was able to do fast laps consistently’. Darren Johnson drops to 35th with his team mate and reigning European Champion Dario Balestri only 37th after a difficult day for the talented Italian. Jilles Groskamp who was second fastest in the first timed practice tried large diameter tyres in the second run but this caused his NT1 to roll when he touched the curbs and as a result he did not improve his time. The Dutch driver will revert to a running a lower diameter tyre tomorrow. Qualifying gets underway in the morning when things in Spain will start to get really serious. Flying Finn Teemu Leino was fastest in the first official timed practice of the 2007 EFRA European Championships. The Team Xray driver topped the time sheets this afternoon in Madrid ahead of Dutch team-mate Jilles Groskamp with the pair separated by just 15/100th of a second after their respective five minutes runs. Third fastest and the only other driver to make 18 laps was Mugen top man Rick Vrielijnck. The leading Serpent was that of young Italian charger Alessio Mazzeo, the current European 1:10 B Champion was fourth fastest just ahead of fellow 720 driver Mark Green who was far happier with his car today having switched to a oneway system overnight. 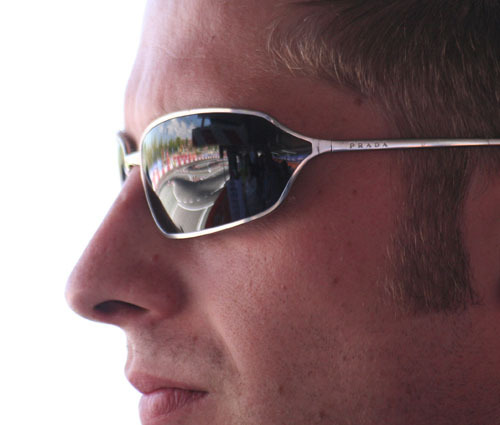 Teemu Saarinen was next up making it also two Mugens in the Top 6. Further down the timesheets Oscar Cabezas managed 10th position, sole Danish entry Martin Christensen was 15th, Michael Salven was 17th followed by fellow German Robert Pietsch in 18th. 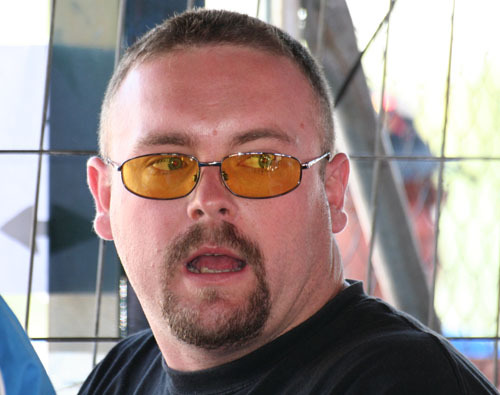 Darren Johnson and Team Magic team-mate Dario Balestri completed the Top 20 in 19th and 20th position respectively. Swede Roland Strom was only 40th fastest. Adrien Bertin suffered problems during his run and completed just 9 laps with fast German lady Sabrina Lechner also failing to complete her run. The only other female taking part in the championship, Sara Pierson from France, failed to start her first timed run. With driver registration now complete EFRA, the sports ruling body, have released a break down of the equipment being used by the 146 present in Madrid. Newcomers to the 1:10 200mm class Xray have the largest number of cars here with 44 with Serpent next with 41. Mugen is represented by 31 racers, followed by Kyosho with 21 and Team Magic with 9. In the engine department Sirio are the most popular choice with 22 users ahead of Novarossi and Mega who each have 21. GRP dominate the tyres while Runner time is the main fuel of choice. Jilles Groskamp topped the unofficial time sheets for Day 3 of the 1:10 200mm EC in Madrid with the Xray NT1 driver the only one to break into the 16 seconds with a lap time of 16.998. The vastly experienced electric touring car racer recorded the time in the final of today’s four 10-minute free practice sessions, bettering his earlier time by a 1:10th of a second. ‘Today was good, the morning started off with a good track cause it was cool and grip was higher. We still had some issues with the clutch. Some laps were really fine but some were not so fine so we tried some different set-ups with the clutch. The set-up in the morning was not perfect cause the grip was higher and I think we needed a harder tyre. The third round was really really good because I ran consistently for the ten minutes. We also used it to figure out the tyre wear and fuel consumption which was very good so no problem in that case’. Closest on lap time to the Dutch driver was Swede Roland Strom with his RB powered Kyosho. ‘It was better this morning. The car was fast. In the evening the car was a bit slippy. I didn’t think the traction was going to change that much as usually for me my set-ups are not that sensitive to track conditions but on this track its a really big difference. I was really struggling in the 2nd and 3rd run mainly because I had a problem with the brakes. In the last run I made the car too soft and it was really rolling around a lot but I am much happier today’. Next fastest was local Mugen driver Daniel Vega followed by Darren Johnson and Oscar Cabezas both on 17.159. With a number of top drivers still not running transponders it is hard to get a true indication of things but Adrien Bertin and Michael Salven, both of whom can be expected to be at the sharp end of the field, appeared pleased with the performance of their cars today. Another not running a transponder but who should feature strongly come the heats is Italy’s Francesco Tironi. 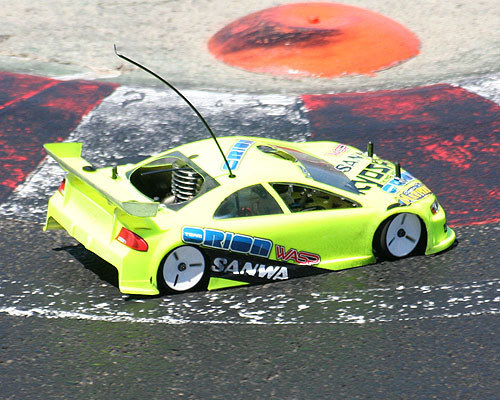 The Sirio backed Kyosho driver said, ‘My car today is good in the morning when the track is cold. It’s very fast and I’m happy. In the afternoon I tried another set-up on the car and it was not very good. I think the best time for qualifying will be the last heat on Friday night and on Saturday morning’. Drivers will have one final 10-minute practice run in the morning with two 5-minute timed runs scheduled for the afternoon. 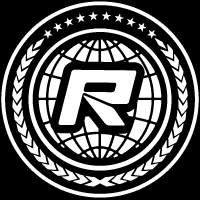 Red RC will keep you updated throughout the day.